This was her a year ago, when I spotted her walking with her boyfriend in Orchard Road. When I asked if I could photograph her for my personal project, they seemed unsure about the whole thing, but eventually said ‘yes’. Her portrait quickly garnered quite a lot of comments and praises when I posted it on Flickr and DeviantArt. 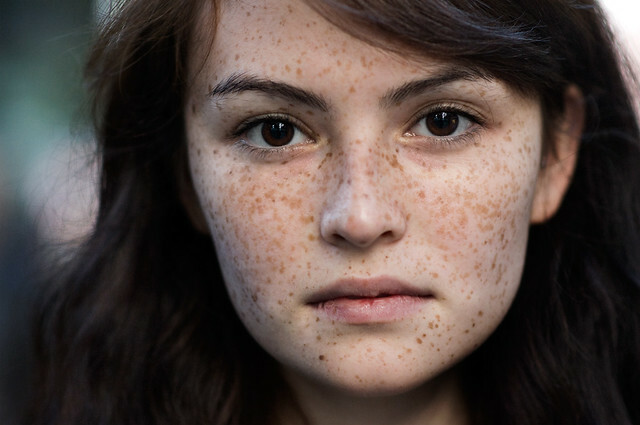 One of the comments stuck in my head: “A girl without freckles is like a night without stars.” I think it’s perfect for her. Before the shoot, my girlfriend and I went to scout for potential locations. It was then that I realized shooting portraits was more than just showing up with a beautiful subject and start clicking pictures. The preparation for the shoot was much more challenging – finding locations with the right background and the right amount of light to match the photos I had in mind was not easy. Furthermore, I had to take note of the time frame to ensure the light from the sun was consistent. Sure anyone can just go there, randomly wander around and hope to get lucky, but I’d rather come prepared. Meeting Atika on shoot day was quite pleasant. I haven’t actually seen her in person since I took her stranger portrait a year ago, so I forgot how tall she was. She seemed shy as she was so soft-spoken. But as soon as I took the first shot, I saw she had this cool confidence in front of the camera. 1) Her mom’s Javanese and her dad’s Irish – a curiously fascinating combination; 2) She used to train for long distance runs – she got this from her mom who’s also a runner. I forgot exactly what her 10k finish time was, but I remember thinking she’s faster than I am (yup, I run too). Unfortunately, she had to stop running due to scoliosis; 3) She’s a cat person, adopted 2 cats: Spotty and Simba. She’s averse to getting kittens from breeders coz she doesn’t like how cat moms are abused to breed continuously. I totally respect that. The shoot went quite well. Even though I’ve already had a previous shoot with Stranger #7, I still didn’t quite get the hang of it. The elements I was looking for when I’m out shooting in the streets are basically the same elements I was looking for here – like a small ray of light shining on her face. Other techniques I used was perspective. When I asked Atika to lay on the ground, I was standing up at first while photographing her. It didn’t come out as good. So I tried crouching down.. still no good. So I literally leveled with her and laid on the ground as well. I think the shot turned out much better. Overall, I had fun. I kept on experimenting trying to work with as much variation as I could, playing around with backgrounds, lighting, and perspective. Atika is so naturally beautiful, it’s almost impossible not to take an uninteresting photo of her. Yet I know I still have a looong way to go in portraiture. But I’m trying.. and I hope to get there someday :) I need to immerse myself with inspiration and keep shooting until I find my bearing in this genre of photography. I’d like to continue photographing portraits. I hope I’ll be able to convince more strangers to do this with me. Big big thanks to Atika for saying ‘yes’ again. I want to show some thanks to you just for bailing me out of this challenge. Just after searching throughout the world wide web and getting ways that were not powerful, I thought my entire life was gone. Existing without the presence of strategies to the problems you’ve solved all through this article is a crucial case, and the ones that could have in a negative way damaged my career if I had not encountered the website. Your natural talent and kindness in playing with every part was priceless. I don’t know what I would’ve done if I had not encountered such a stuff like this. I can also at this moment relish my future. Thanks so much for this impressive and amazing help. I won’t think twice to suggest your blog post to any individual who desires tips on this issue. certainly like your web site however you have to check the spelling on quite a few of your posts. A number of them are rife with spelling issues and I find it very troublesome to inform the truth however I¡¦ll certainly come back again. Great tremendous issues here. I am very satisfied to look your post. Thanks a lot and i’m taking a look ahead to touch you. Will you please drop me a mail? Normally I don’t learn article on blogs, but I wish to say that this write-up very pressured me to check out and do it! Your writing style has been amazed me. Thank you, very great post. you are really a excellent webmaster. The web site loading speed is amazing. It seems that you’re doing any distinctive trick. Moreover, The contents are masterpiece. you have done a great task in this subject! wonderful points altogether, you just received a new reader. What might you recommend in regards to your submit that you just made a few days ago? Any positive? I just wanted to type a small message to appreciate you for these remarkable tips and hints you are posting here. My extensive internet lookup has finally been rewarded with incredibly good suggestions to write about with my family. I ‘d repeat that many of us website visitors actually are unquestionably fortunate to be in a useful site with many awesome professionals with helpful techniques. I feel somewhat happy to have encountered the site and look forward to many more thrilling moments reading here. Thank you again for a lot of things. fantastic submit, very informative. I wonder why the opposite experts of this sector don’t understand this. You should proceed your writing. I’m sure, you’ve a huge readers’ base already! you are really a just right webmaster. The site loading pace is incredible. It seems that you are doing any distinctive trick. Also, The contents are masterwork. you’ve performed a fantastic task on this topic! Thanks a lot for sharing this with all people you actually realize what you are speaking about! Bookmarked. Kindly additionally talk over with my website =). We may have a link change contract among us! I have been exploring for a little bit for any high quality articles or weblog posts in this sort of area . Exploring in Yahoo I ultimately stumbled upon this site. Studying this information So i¡¦m happy to convey that I have an incredibly good uncanny feeling I discovered just what I needed. I so much without a doubt will make sure to do not overlook this website and provides it a glance regularly. I’m commenting to let you be aware of what a great discovery my wife’s child experienced reading through yuor web blog. She discovered too many details, which included what it is like to possess an awesome helping mindset to make folks without hassle grasp specific tortuous subject matter. You actually did more than people’s expected results. I appreciate you for imparting the beneficial, safe, explanatory and in addition cool guidance on your topic to Jane. I wish to express thanks to the writer for rescuing me from such a issue. Right after looking throughout the internet and coming across strategies which are not productive, I was thinking my entire life was over. Existing minus the approaches to the difficulties you have fixed through the website is a serious case, and those that could have in a negative way affected my entire career if I hadn’t discovered your blog. The understanding and kindness in handling a lot of things was precious. I’m not sure what I would have done if I had not come across such a point like this. It’s possible to at this time look ahead to my future. Thanks for your time so much for your professional and results-oriented guide. I won’t hesitate to refer your web blog to anybody who needs guide on this matter. Thank you for any other informative blog. Where else may I am getting that kind of information written in such a perfect approach? I’ve a challenge that I am just now operating on, and I have been at the look out for such information. What i do not realize is in reality how you are now not actually a lot more neatly-liked than you might be now. You are so intelligent. You understand therefore considerably in the case of this matter, made me in my opinion imagine it from a lot of varied angles. Its like women and men don’t seem to be interested until it is one thing to do with Girl gaga! Your individual stuffs excellent. Always take care of it up! I just want to mention I am just very new to weblog and absolutely loved your web-site. Probably I’m want to bookmark your blog post . You definitely come with tremendous writings. Kudos for revealing your web site. I¡¦ve been exploring for a little bit for any high quality articles or weblog posts on this kind of area . Exploring in Yahoo I at last stumbled upon this web site. Reading this information So i¡¦m satisfied to convey that I have a very good uncanny feeling I came upon just what I needed. I so much definitely will make sure to don¡¦t put out of your mind this site and give it a glance on a relentless basis. Thank you for some other excellent post. Where else could anybody get that type of information in such a perfect approach of writing? I have a presentation subsequent week, and I’m on the search for such info. I will immediately clutch your rss as I can not to find your email subscription link or newsletter service. Do you’ve any? Please allow me realize so that I may just subscribe. Thanks. Fantastic goods from you, man. I have understand your stuff previous to and you are just extremely wonderful. I really like what you’ve acquired here, certainly like what you are stating and the way in which you say it. You make it entertaining and you still care for to keep it sensible. I can not wait to read much more from you. This is actually a wonderful site. Great site. Plenty of helpful information here. I am sending it to some friends ans also sharing in delicious. And certainly, thank you on your effort! Excellent web site. Lots of helpful information here. I am sending it to several buddies ans additionally sharing in delicious. And naturally, thank you for your sweat! I¡¦ll immediately seize your rss as I can not find your e-mail subscription hyperlink or e-newsletter service. Do you have any? Kindly let me realize in order that I could subscribe. Thanks. I have read a few just right stuff here. Certainly value bookmarking for revisiting. I wonder how a lot attempt you place to make any such excellent informative web site. Great post. I was checking constantly this blog and I’m impressed! Extremely useful information specifically the last part :) I care for such information a lot. I was looking for this certain info for a long time. Thank you and best of luck.